Where man treads lightly and nature is respected. 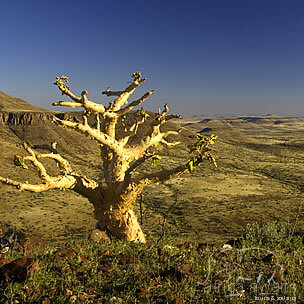 Desert adapted wildlife forge a precarious existence amongst the towering basalt mountains and Mopani-shaded rivers beds of the Kunene region. This apparently unforgiving landscape is actually refuge to a diverse number of plant and mammal species. Desert elephant and black rhino share boulder strewn valleys with watchful cheetah and thundering herds of oryx. 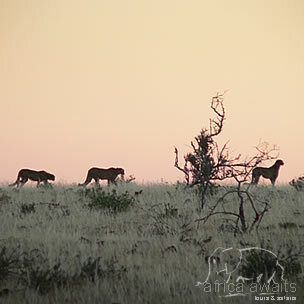 Dew darkened game trails show the heavy track marks of lion and the mountain zebra they hunt. Scorpions prowl between volcanic rock shards and snake eagles drift through the warm afternoon breeze. The Omatendeka and Anabeb Communal Conservancies hold the exclusive concession rights for the 400km² Etendeka Concession and they have entered into a joint venture agreement with Big Sky Lodges and Dennis Liebenberg for the management of this Concession. All operations on this Concession will directly benefit the people of these two Conservancies who live in remote and isolated areas bordering the concession in the north. Guest vehicles are parked at the pickup point situated close to the Palmwag veterinary fence gate and guests are transferred the 16km 4WD road to the secluded Etendeka Mountain Camp in open game drive vehicles by our experienced guides. 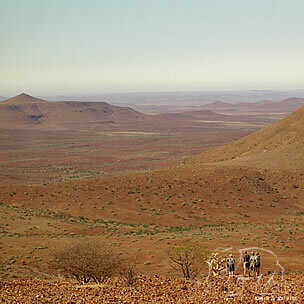 With your holiday, safari or business trip from in to Etendeka Mountain Camp in Namibia.